Sometimes it can be very useful to use the data connection of our phone to connect the tablet or the PC to internet. If we are in a cafe, traveling, or wherever else we want to use internet in any other device than the smartphone, we need to create and share a network between the phone and those devices. 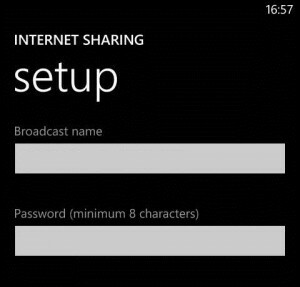 In Windows Phone is very easy to perform this process, known as tethering. First, we need to create a shared Wi-Fi network. To do so, we need to go to Settings and look for the Internet Sharing option. 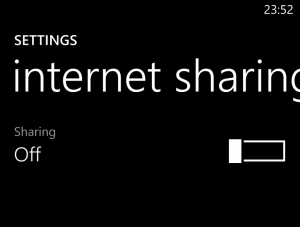 Inside, we will see the option to Enable Internet Sharing. Once we have this option active, we have to go to Settings and fill in the fields that appear in the next screen. We need to set the network name and choose the type of security we want, basically if the network will require a password or not. If we choose to use a password protected network (WPA2), we can write the key in the corresponding box, and it will be required on any other device that attempts to connect. It is highly recommended to always use that type of connection, because if we use an open network anyone can connect to it and we can have an excessive consumption data, which will result in a much expensive bill than expected. When the network is activated and configured, we can access it from any other device using the password that we have defined in the phone. If we have a device with Microsoft Windows 8.1 (PC or tablet), we can pair this device with our phone via Bluetooth and also connect it to the network. If we do this, we don’t need to activate the connection on the phone every time, it can automatically use the connection of the Windows Phone if the devices are paired. However, we must keep in mind that this connection through Bluetooth is only possible in versions of Windows Phone 8.0.10501.127 or later.